We are offering to our clients Oil Burner Sequence Controllers, Gas Burner Sequence Controllers and Flame detectors. 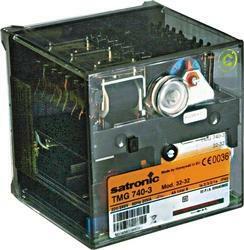 Procured from Satronics, these are combustion control products for Safe and efficient operation of the burner. We test these on stringent parameters before supplying to our esteemed clients. We are engaged in supplying of burner controllers, gas Burner Controllers and oil burner controllers R4412, R7140 G, L, M. Flame detectors C7027 Flame amplifier. Procured from Honeywell, these can be provided to our clients in customized specifications as per their requirements. We are offering oil burners which are procured from Petercem which is a leading manufacturer of Petercem Gas Ratio Controllers & Oil Burner Components and gas controllers such as gas ratio controllers, air gas ratio controllers, fuel ratio controllers and pressure switches. Our MA 810 & MA150 are control and safety equipment for oil burners. Provided with amplifier for flame detection, these utilize the flame sensor with photo resistant cell Model 8205.